Last year it was the .22 Nosler and this year the .224 Valkyrie. 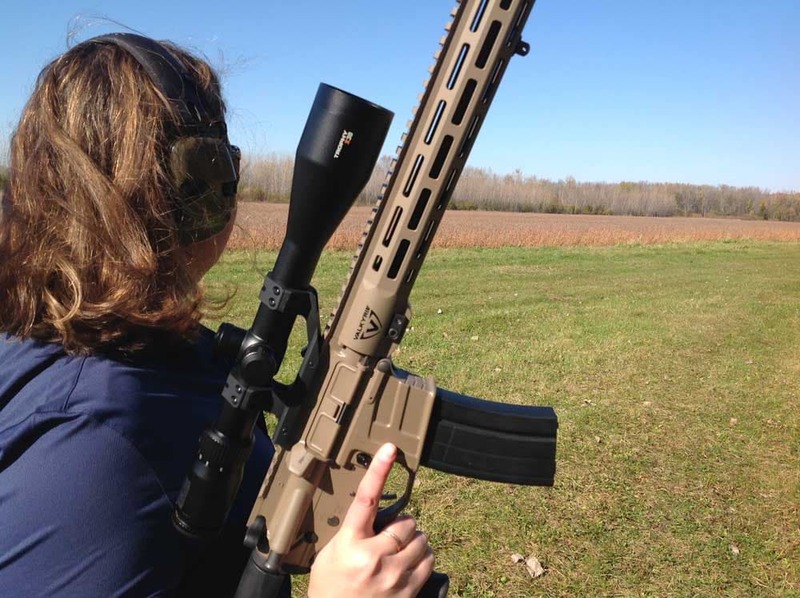 New hunting and long-range calibers are coming faster than most hunters can find the ammo. What makes the .224 Valkyrie different from others that have come and gone just as fast? Guns.com finds out while pulling the trigger on Savage’s MSR Valkyrie, the first rifle built for the zippy new caliber. 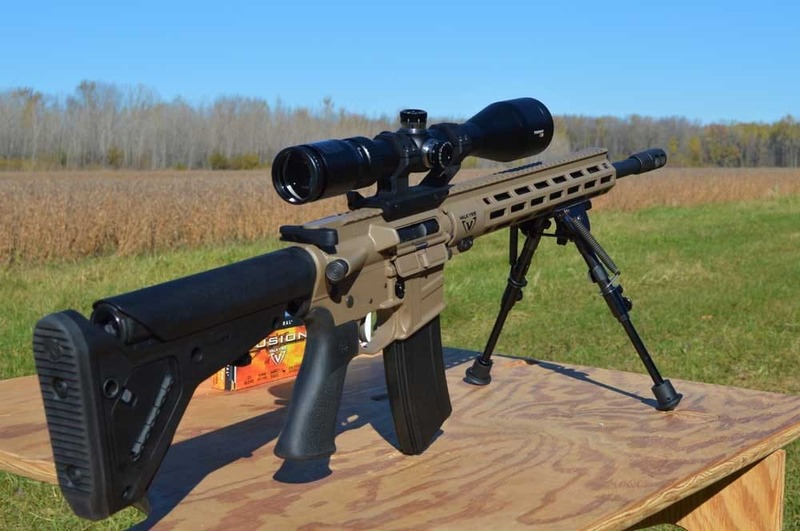 Savage’s MSR-15 Valkyrie builds on the family of semi-automatic MSR (Modern Savage Rifles) launched by the company in 2017. Our test rifle comes with the Flat Dark Earth (FDE) Cerakoted forend, upper, and lower. The 18 inch barrel with 5R rifling is topped with a tipped with a turnable muzzle brake on 1/2×28 threads. The Valkyrie makes use of quality components with a Hogue pistol grip and Magpul UBR Gen 2 buttstock. The rifle uses a mid-length gas system with an adjustable gas block. A two-stage trigger is icing on the cake for long rangers. The whole thing weighs 7.88 pounds empty. The Valkyrie, stamped Made in Massachusetts, ships in a cardboard box with a single 25-round magazine, made by PRI in Ohio. MSRP on our test model Valkyrie is $1,499, though a black version with a few less frills is available with an MSRP of $1,249. We’d be remiss to look at the rifle without also addressing the round. Whereas .22 Nosler barrels usually utilize a 1:8 twist, our MSR-15 Valkyrie’s 1:7 twist rate is intended to stabilize the longer and heavier bullets better at extended ranges from 500-1,000 yards. 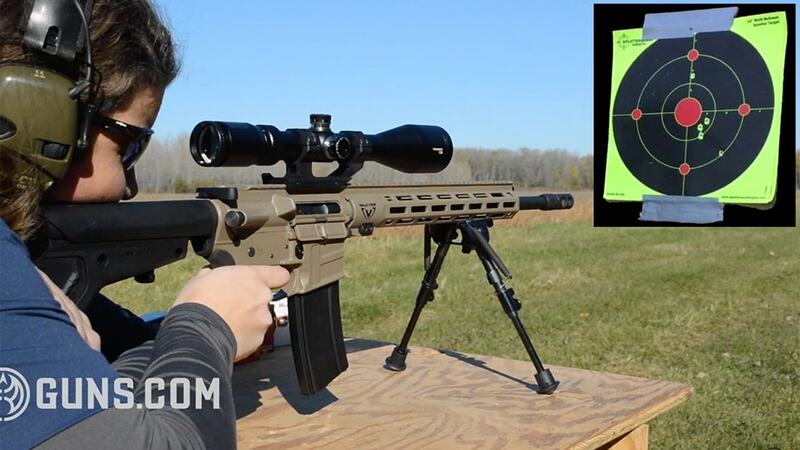 The .22 Nosler is a fine round that we’ve fired with wonderful accuracy results. While the average shooter would likely never notice the difference in accuracy or performance between the two young rounds, what they will find is a real price and availability difference in ammunition. Federal was fully prepared for the launch of their new baby with a wide range of FMJ, Match, Varmint, Soft Points, and even bigger game hunting rounds, all available at once. Best of all, prices range from $9.99 to $30.99 and at those real-world marks, puts the accurate and capable round immediately in the legit and lasting conversation. Better still, outside companies like Hornady have already joined the ammo production milieu. The Valkyrie remains supersonic past 1,300 yards. Though the caliber was designed around an AR-platform, several bolt action rifles have already hit the market, like the 224BA from Masterpiece Arms while others are forthcoming, including a precision rifle from Mossberg. Much like the Nosler, the .224 Valkyrie rounds require use of a 6.8 SPC magazine. Unlike the Nosler, however, Valkyrie ammunition is already available from multiple manufacturers in bullet weights from 60- to 90-grains, with mid points at 72, 75, and 88 grain pills. 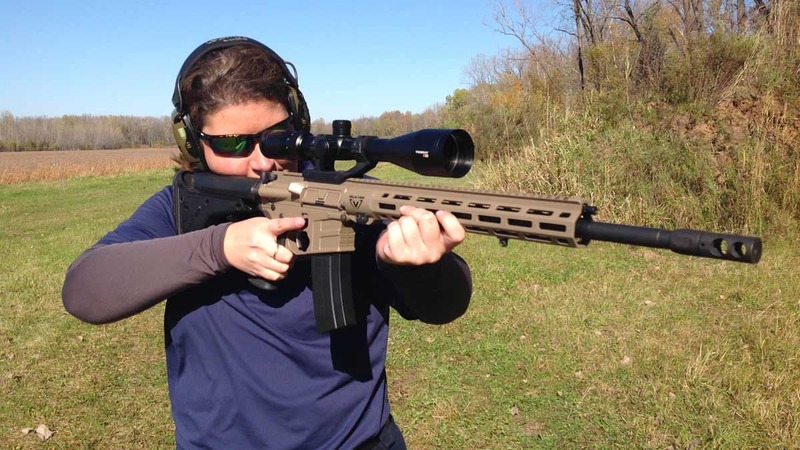 The Valkyrie is built to be a true and capable 1,000 yard shooter, and while we are unable to fire at those ranges locally, we did stretch things out on our home range. We headed to the range with a nice mix of ammunition, considering this is a newly launched platform and caliber: Federal Fusion 90-grn, American Eagle 75-grn TMJ, Hornady Match 88-grn ELD, and Federal Premium 60-grn Nosler Ballistic Tip. As we hoped, the rifle gobbled and spit out every round with 100 percent reliability. The Savage Valkyrie shined on targets. Because this is a long-range rifle, we skipped right past the hundred-yard mark and zeroed at 200, with a wicked 20-25 mph crossing wind. Average two hundred-yard groups measured a snug 1.2-inches. The best 200-yard, three shot group was 0.90 inches using the Hornady Match 88-grain ELD bullets. Going out to 350 yards, groups opened slightly, but still held tighter than many rifles shoot reliably at 100, all from a semi-auto with an 18 inch barrel. At 500-yards, we were shooting fairly quickly and ringing a six-inch gong repeatedly. Though we were limited to the 500-yard distance, I have no doubt the Valkyrie would ring that steel at — and beyond — 1,000. We would love to see what this rifle could do at distances with a barrel longer than the 18 inch on this MSR. The two-stage trigger breaks clean at three pounds-seven ounces. The Cerakote finish on our test model not only looks sharp, but held up well to significant round volume, which often leads to excess wear at the rear of the ejection port. Magpul’s UBR Gen 2 buttstock is comfortable for use with a scope and offers ample adjustment for most any build and style of shooter. The full-length picatinny top rail offers plenty of room for mounting a quality optic, for which this rifle practically begs. Our Bushnell Trophy X30 with its 8-24×50 in a Weaver mount put us on target with ease. With parts from Magpul and Hogue, partnered with the FDE Elite Cerakote, the rifle looks and feels good. The matte finish is ideal for hunters in the field. Though the Valkyrie round requires 6.8 SPC magazines, they are easy to come by, and we used both the provided PRI 6.8 SPC magazine as well as aftermarket AR-Stoner versions with the same positive results. The mid-length adjustable gas system allows shooters to tune the rifle for cycling most any load, not that we needed to tweak anything. Hunters will want to take special notice of the Federal Fusion MSR 90-grain as well as the Federal Premium 60-grain Nosler Ballistic Tip Varmint, capable on medium-sized game and predators, respectively. These days, more and more hunters embrace AR-platform rifles for everything from varmints to predators, hogs to big game, and the Savage Valkyrie is an ideal launch pad. Long range shooters will enjoy the 90-grain Sierra Match King the whole platform was built around, while the cheap Total Metal Jacket rounds sell on store shelves for $9.99. Hornady just announced a host of new rounds in the caliber as well. There’s not much not to like about the MSR-15 Valkyrie, though if we could have one wish, a longer barrel option would be a boon to this round. It does look like an MSR Long Range with a 22 inch barrel will be forthcoming from Savage. We’re looking forward to the launch of Mossberg’s Precision Rifle in Valkyrie as well. Speaking from 800-yard experience at SHOT, the Masterpiece Arms in .224 Valkyrie is as sweet a bolt action as they come. Complete uppers drop easily on existing AR-15 lowers, and they are available from companies like CMMG, Stag Arms, and many more. In our book, all those factors add up to a sure sign of a bright future for the .224 Valkyrie. This was a double win: not only is the Savage MSR Valkyrie a pleasure to shoot, but the .224 Valkyrie round itself is a champion as well. The combination of reasonably-priced and readily available ammunition, coupled with guns and uppers in dozens of manufacturers and configurations make the .224 Valkyrie immediately sustainable. Keep an eye on Guns.com as we go more in-depth with the .224 Valkyrie in even more platforms for hunters.